Each Teen Science Café node adapts the Teen Science Café program to the needs of the audience in their region. Early on, two of the Gateway Teen Science Café node sites reached out to middle school students, adapting the teen cafe model, which was originally designed to reach high school students, mixing in the critical middle school age group. Recognizing the importance of reaching middle school audiences before they self-select themselves out of a future in STEM fields, The Academy of Science – St. Louis has long offered a membership program for both middle (6-8 grades) and high school (9-12grades) students called Junior Academy of Science. Since all of the programs offered through Junior Academy are open to both age groups, it was important to us to include middle school students on the Youth Leadership Team and at the café events. As middle school students do not often have leadership opportunities, especially chances to design and implement programs for other students, it was important to us to open the Café Youth Leadership Team application process to these students. Of the Youth Leadership applications we received in each year of the program, about half were from middle school students ­– a strong indicator of the desire in our community for middle school leadership opportunities in science. Knowing that the broad age range would change the needs of our participants, The Academy of Science – St. Louis developed a Youth Leadership Team mentorship component in the form of a Mentorship Committee. High school students on this committee and those serving on other committees, mentor middle school Youth Leaders by providing leadership role models and by helping to develop training that promotes leadership skills. 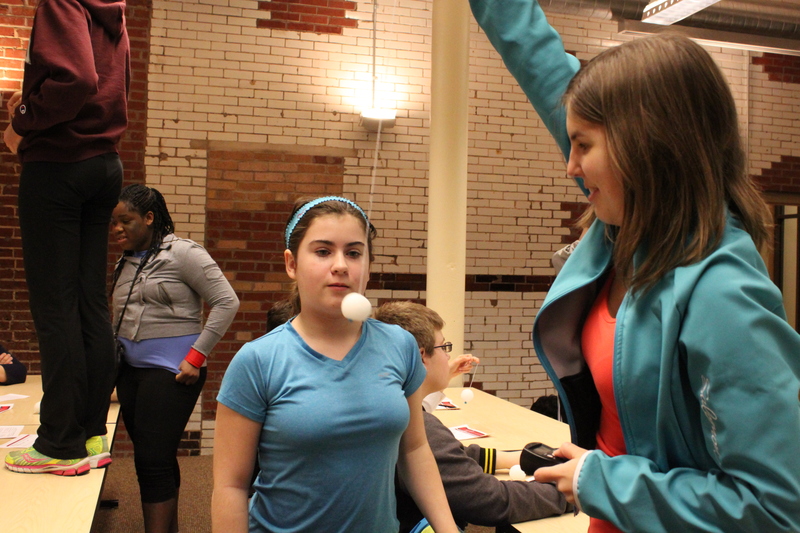 Additionally, the high school students develop Teen Science Cafés activities related to the presenters’ topics that either build upon the knowledge of students, or provide opportunities for students to connect with each other. At the café dry-runs, our Youth Leaders have the opportunity to preview activities to determine if they are interesting to teens and if the activities are too advanced for middle school students. Often the activities are a good fit for both middle and high school students, but if an activity seems challenging, high school students have volunteered to sit with groups of middle school students at the actual cafes to assist. For the Gateway node, sites that have included the middle school audience have found that it adds to the richness and relevance of the café experience for high school students who gain leadership and mentoring opportunities. The different age groups also stimulate more consensus building and critical thinking. For the middle school students, the program is a chance to build confidence and skills under the guidance of their older peers. Including middle school students in your Teen Science Café is a choice each node or site can make. It is important to consider your organization’s audience and community needs as well as your Youth Leadership Team’s capacity to work with this age group. For example, the Café Scientifique in New Mexico has found it appropriate to invite middle school students to come to cafes in the last semester of 8th grade as a recruiting tool to encourage students continue through high school with the program. Every site has the opportunity to decide what grade levels are appropriate for their own mission and goals of the program.